Sometimes a book comes along that makes you wish the entire rest of the world would just disappear and leave you to get on with the important business of reading. A book that you’re picking up in your breaks between teaching classes, caring not one whit that you’re already a couple of minutes into class time and still haven’t left the teachers’ room. One which has you cursing every pedestrian distraction which takes you away from it’s pages – “Dinner??? Who needs food these days?”. Mira Grant’s Feed is one such book, one I had dismissed as a potential rainy day time-passer and left neglected on the bottom of the virtual pile. I am so, so glad I randomly decided to give it a shot. So glad. 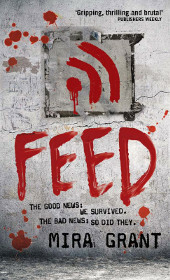 Let’s get this out of the way first; Feed and it’s sequels are, ostensibly at least, zombie novels. I know that’s going to put some people off but bear with me. There’s a whole hell of a lot more going on in these pages. Set a couple of decades following the event known as The Rising (eerily close to current day), the world is dealing with the aftermath of a series of unfortunate events. A combination of scientific curiosity, medical genius and well-intentioned yet idiotic do-goodery have unleashed a plague upon mankind. The dead walk. And they hunger. I’ll leave the details – and there are many – for when you pick up the book, but suffice to say that the zombie origin story in play here is one of the most plausible (in the loose, fictional sense) and original I’ve stumbled across. In fact the depth and knowledge with which is is suffused carries across every aspect of the book, from character to background to, well, everything. This post-Rising world has given rise to a new form of information distribution. It transpires that old media really dropped the ball during the disaster, toeing he government line and assuring everyone there’s nothing to see here, even as the undead are breaking down the door. The only ones getting the truth out there were bloggers, not beholden to any corporate or political interests and full of Romero-based advice for dealing with the recently deceased. While newspapers and TV stations remain in business, blogging is suddenly moved far up the pecking order with the best content providers netting hefty salaries, wide audiences and lucrative sponsorship deals. One such blogging team comprises adopted brother and sister Georgia (named for Mr Romero, very common post-Rising) and Shaun as well as a host of accomplices. Opportunity comes knocking in a chance to cover the upcoming US presidential elections, the first time a new media team has ever been invited to accompany a candidate on his tour. It seems like a dream come true but before long the body count starts rising and it’s hard to know whether zombies or humans pose the greater threat. Now here’s where the genius of Feed, Deadline and Blackout lie. They’re zombie books, right? But there is almost no zombie action. What we are treated to comes in the form of the occasional large-scale set-piece rather than a continuous gruelling onslaught of the undead. Instead the bulk of the books comprise two far more important aspects. The first is the political and cultural, dealing with the campaign trail and the media following it. The analysis of the future of blogging is just wonderful to behold, especially the fracturing of bloggers into Newsies, Irwins and Fictionals (as well as subgroups such as Stewarts), all co-existing with and dependent on the others. Mira Grant sharply picks apart the flaws of old media and the potential benefits of the new, while being careful not to fall victim to her own hype. Her blogosphere is intensely detailed and believable, a world within a world which is all too easy and comfortable to slip into. And then there are the politics. My god, she totally nails it with her depiction of a society ruled by fear to the extent that the fear is almost welcomed for the security measures it provides. They say the very best science-fiction depicts not the future but our own present and this is no exception. The security theatre surrounding our day-to-day existence in the post-9/11 world is brought to life perfectly by Newsflesh‘s blood testing kits. Not only do they serve to build suspense in a truly beautiful way but they cut right to the heart of the shackles we ignore, if not gladly wear, in real life. The trilogy’s second beating heart is the characterisation. It’s a long time since I’ve found myself so heavily invested in people within the pages of a novel, found myself feeling so keenly in tune with them, so familiar. And of course, so beaten and bruised when Grant deals one of the literary body-blows at which she seems so adept. The team of Georgia and Shaun are near-perfect protagonists – edgy without seeming arrogant, colourful without being over the top and imbued with some mystical energy which seems to bleed off the page and infect your day-to-day life. The supporting cast is fleshed out (haha) equally well, from secondary players like Becks and Mahir down to bit parts like the wonderfully unhinged Dr Abbey. Hell, even her dog has more personality than a ot of leading fictional characters. I can do nothing but heartily endorse these books and urge you to get reading right now. A word of warning though – it’s Feed, then Deadline, then Blackout. I steamrolled though Feed at an incredible pace and found myself slavering for more. Unfortunately I was using ebook versions. So I started the next book and wondered why there was so much discussion of seemingly major events following the first installment which were given little more than cursory treatment; disaster, deaths, betrayals, all dealt with in passing sentences. It wasn’t till 300 pages in that I checked. Yup, I was reading book three. Exit stage left, back to Deadline, charge through it then finish Blackout. And it was still one of the best reading experiences I had in 2014. That says it all really.